Herm Sprenger Company introduced very convenient novelty for those dog owners who use Pinch Collars in daily walkings and professional trainings. It is extra links for Stainless Steel Pinch Collar. Why is it convenient? Because there is no necessity to buy new collar as your dog grows or gains weight. 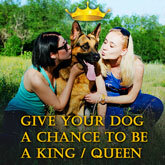 This offer will do for those who have strict budget and can't afford new pinch collar. These extra links snap in easily for extra length. Besides there is no need in having special tools or skills in order to add extra links. These Extra Links for Herm Sprenger Stainless Steel Pinch Collar are for 1/8 inch (3.25 mm) diameter. 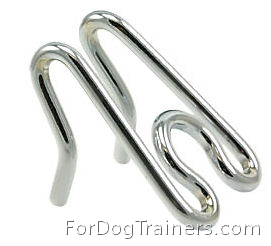 One link will add 1 2/5 inch (3.5 cm) to the total collar's length. These links are made of Stainless Steel. This alloy has many advantages over the normal steel. It has a higher resistance to oxidation (rust) and corrosion in many natural and man-made environments. Stainless steel is, above all, a very practical material, however, this material is both aesthetically beautiful and noble. Guy, Where do I go to leave feedback when it arrives. I got an earlier order from you last month and everything was so much higher quality than anything I have found here in the US that I am very pleased and will order exclusively from you. Even though it took a little longer to arrive since it shipped from Israel, that did not bother me a bit since there is no comparison to your quality. Keep up the good work and I hope all of you are safe over there!!! Greetings from Greece! I just received the package with the products! Thank you very much! 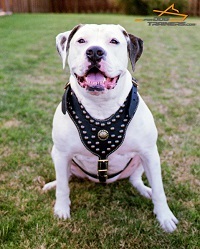 The leather leashes and collars are amazing!! Excellent quality! I am writting to you to say i got my order today 28/01/2013 via Amstaff Store inv#7800028 i am well pleased , great quality and service ! Thankyou. If you would like a positive review for Amstaff Store please advise where and i would be only to happy to do this. i notified you as i had trouble logging on today at Amstaff Store.